Minneapolis, MN —In 2010 the Minnesota legislature set a goal: universal access to high speed broadband throughout the state by 2015. As 2015 approaches we know that large parts of Greater Minnesota will not achieve that goal, even as technological advances make the original benchmarks increasingly obsolete. But some Minnesota communities are significantly exceeding those goals. Why? The activism of local governments. A new report by ILSR, widely recognized as one of the most knowledgeable organizations on municipal broadband networks, details the many ways Minnesota’s local governments have stepped up. 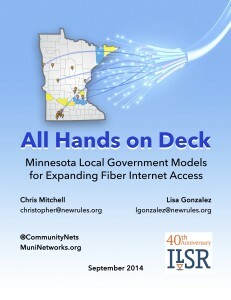 “All Hands On Deck: Minnesota Local Government Models for Expanding Fiber Internet Access” includes case studies of 12 Minnesota cities and counties striving to bring their citizens 21st century telecommunications. Windom, which is one of the most advanced networks in the state, built their own network after their telephone company refused to invest in their community. Dakota County showed how a coordinated excavation policy can reduce by more than 90 percent the cost of installing fiber. Lac qui Parle County partnered with a telephone cooperative to bring high speed broadband to its most sparsely population communities. Read how these and other communities took control of their own connectivity and their community vitality. Some did it alone while others established partnerships; each chose the path they considered the best for their own community. Where we can have a free market, we should have a free market. That is one of the main reasons I support UTOPIA, because it allows competitive access on those lines. I know it is only one line, but it makes sense to only have one line. And if I only have one line, I would rather it be my local government owning it – it is a lot easier to get a hold of the mayor of Murray than it is the CEO of Qwest when I have a problem.